For punk rock icon Mike Watt, it could be easy to get carried away by the fame his history has provided him, or even play it safe in his 50s. As the bass player for legendary “econo” punk band the Minutemen, Watt and singer D. Boon carved up an exciting new niche of fast paced, no filler punk in the eighties. Unfortunately the Minutemen came to an tragic end when D. Boon’s life was cut short in a traffic accident. Watt receded for awhile from the music he had put so much effort with his childhood friend, but later returned in the band Firehose. Besides going solo in the past decade or so, he’s gotten to work with many well known musicians, including the 21st version of The Stooges with Iggy Pop. Even with all of this attention, Watt is a genuinely humble man, making every lyric, chord and moments in between count. There’s no filler in Mike Watt’s life. Recently, Watt found the courage to look back to the Minutemen through his third solo album, “Hyphenated-Man,” or as he has referred to as his third opera. Inspired by the Minutemen’s quick minute to two average per song fiery speed of life energy as well as some Hieronymus Bosch paintings that had long fascinated him, Watt crafted thirty riveting songs journeying through Mike Watt’s uncanny, wistful and unique spiel (what he calls lyrics) that speak on middle age. Even his 50s, Watt is no slouch and still discovering. Watt and his band the Missingmen (which features guitarist Tom Watson and drummer Raul Morales) made a stop at Shank Hall Saturday night. Throughout the night it was evident that they wanted to show that sometimes pure passion ultimately wins over age, firing off song after song without taking a break. Often referring to his new material as “weird,” Watt once again told the crowd – as the band prepared to play the new album – to expect an interesting set. As a big fan of the new album, an impressive feat that shows that Watt’s still got a lot in him, this was exciting news..
As the band fired into that album’s opening track “Arrow-Pierced-Egg-Man” (all the tracks from the album follow a similar pattern), it didn’t take long to see that the pairing of Watt with his fellow band mates were the perfect ingredients to create a maximum wattage of pure energy. Watson looked very comfortable on guitar as he moved around stage flicking out catchy riffs, and Morales certainly showed he knew how to create some infectious punk beats. And Watt? 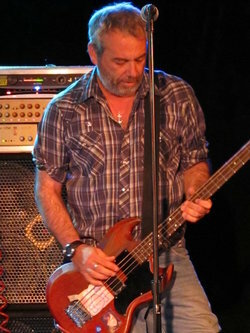 Watt speaks more than sings his lyrics, a method which adds a distinctively unique spin on punk rock. His voice is as strong as ever, with it’s wise, wistful nature and ability to meet the high and low notes needed in this form of punk rock. Each song from the album is like a hidden treasure awaiting to unleash it’s knowledge on the listener and is best played with the speakers blaring or live in person. It was evident that the wear-and-tear from the tour was getting to Watt, as he had a knee brace and had to be helped up and down the stairs. But when Watt got on the stage the energy from the music and seeing all the people that showed up he set out to defy his age and show his passion is as youthful and vigorous as ever. After playing all of the 30 tracks totaling around 50 minutes without much of a break, the band stepped off stage, tired but feeling accomplished of tackling the album in full. After a few moments of cheers chanting for the band to return they did, and brought even wider smiles on faces of many as they fired into some of the songs from Watt’s history, many coming from the Minutemen. To the relief of Watt who needed a moment to give his voice a rest, Watson took over on vocals for most of the encore while Watt focused his attention on playing bass. Watson might not have given the songs the same impact as D. Boon but he did quite a fine job. Watt returned on vocals later and while visibly spent by the performance, it was evident that he gave every bit of his energy to truly make the songs come alive and leave the crowd in awe. The opener, Couch Flambeau, opened the night with an energetic set of punk and rock of their own, and showed that they probably got inspired by the likes of the Minutemen. After the show, as fans crowded the stage for autographs and photos with a noticeably tired but still quite exuberant Watt, one fan pulled him aside and told him “D. Boon would be proud.” Watt was overcome with tears and happiness and as he gave the fan a hug, with a emotional “Thank you.” Even in his 50s, Mike Watt hasn’t lost sight of what got him interested in punk rock and how to stay grounded, humble and enjoy the quick and small moments of life.